A year after Jochen Rindt's tragic death, Peter Gethin secured his first grand prix victory at the Italian Grand Prix at Monza. Driving a Yardley BRM, Britain's Gethin won a slipstreaming thriller at an average of 150.75mph and he won by just one one-hundredth of a second. Chris Amon's V12 Matra took pole position from the Ferrari of Jacky Ickx while the BRMs of Austrian GP winner Jo Siffert and Howden Ganley occupied row two. 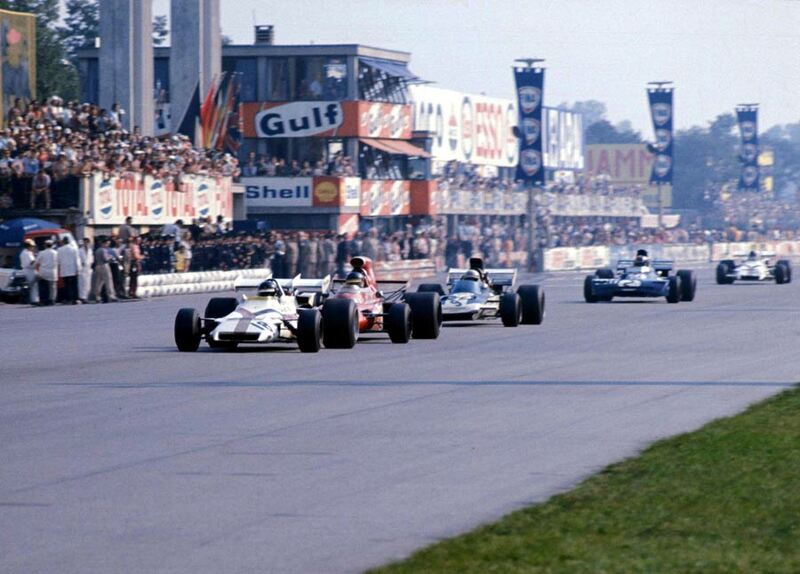 The best of the Cosworth-powered cars, Jackie Stewart's Tyrrell, was on row three alongside Ronnie Peterson's March. But it was Clay Regazzoni who made a storming start to take the lead in his Ferrari, the Swiss driver launching himself from row four to take the lead from Peterson who squeezed by during the opening lap to re-take the lead. Peterson then handed over the race leader's baton to Stewart before Regazzoni slipstreamed his way back into the lead. The action was equally intense behind the leaders with Francois Cevert, Siffert, Ickx, Ganley and Gethin's BRM battling it out. Stewart retired on lap 16 when his engine failed and Ickx suffered a similar fate on the same lap while Regazzoni joined them on the list of retirements two laps later after his Ferrari also suffered an engine failure. As the race wore on, Siffert and Ganley fell away from the leading bunch with overheating engines but the Surtees of Mike Hailwood and Amon's pole-sitting Matra caught up to the leading group and started to become more of a threat. His undoing had been a poor start but he was charging by half-distance and for a brief period he led the race. Then, in keeping with his miserable luck, his visor fell off his helmet and he could no longer run at full speed with wind and grit flying into his uncovered eyes. To add to his woes his engine began to overheat and he dropped away from the leading group of five drivers. Four cars were within touching distance throughout the final lap, and as they emerged from Parabolica - the final right hander - it was Gethin, slipstreaming brilliantly, who beat Peterson by a matter of feet. So close were they that Peterson, who had zipped past Gethin almost as soon as they crossed the line, believed for a moment he had won. Six tenths of a second separated first from fifth, the closest blanket finish in Formula One history. Cevert took third with biker Mike Hailwood, in his first race of the season, fourth. To the undisguised disgust of the home crowd, who whistled and jeered, both Ferraris retired, meaning Tyrrell secured the constructors' championship thanks to Cevert's third.